Revered Elders, Distinguished Guests, Dear Sisters and brothers, Ladies and Gentlemen! Assalamu Alaikum Wa Rahmatullahi Wa Barakatuhu. May the Almighty Lord make you all the recipients of His peace, mercy and blessings! 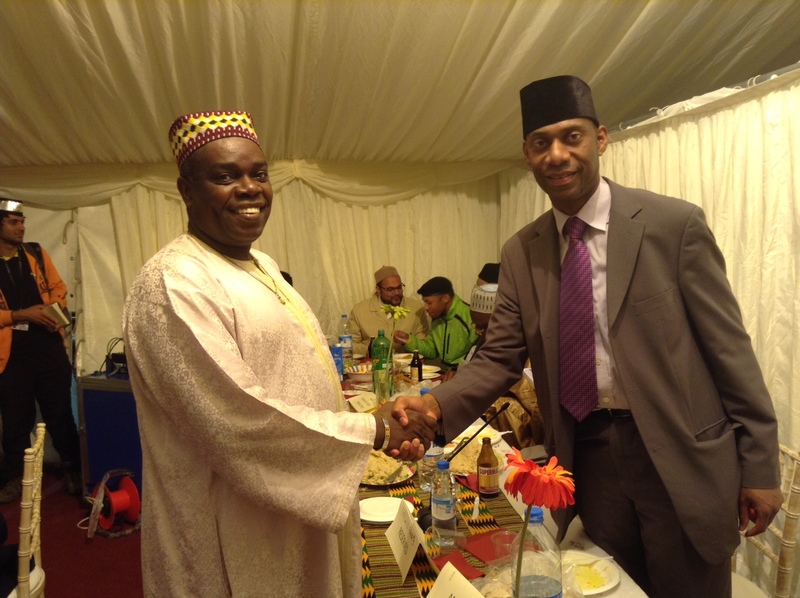 It is a tremendous honour and privilege for me, as President of the Pan-African Ahmadiyya Muslim Association UK, to welcome you to this special Pan-African event. Today, at what is an historic event for our Association, my heart is aglow to see so many delegates and guests from around the world gathered together as one, united by our common heritage and by our affiliation to our motherland – the continent of Africa. I take a moment to give thanks and praise to our God, the Fountainhead of Limitless Grace, Who has so lovingly honoured us with countless opportunities to serve Him. Nothing, including this event, would have been possible without His infinite blessings. We laud Him and invoke His blessings on His Noble Prophet. Founded in 1986, the Pan-African Ahmadiyya Muslim Association (PAAMA) UK, is a subsidiary organisation within the Ahmadiyya Muslim Community. As its name implies, PAAMA is comprised of all Ahmadi Muslims of African provenance and its objective is that of uniting such members under one umbrella and that of serving both the British society in which we reside and the continent of Africa from where we hail. For the members of the Community joining us from around the world as delegates to this International Annual Convention, it is important to point out a uniqueness about PAAMA and that is although it is a UK association, it is also has a relationship with Wakalatul Tabshir, the Foreign Missions office, and we do receive guidance and steer from His Holiness, Hadhrat Khalifatul Masih through this office. Furthermore, I, myself, as President of the Pan-African Ahmadiyya Muslim Association, do have direct access to His Holiness to receive guidance and direction from him on various matters. As a matter of fact, this very event we are holding here this evening is as a result of a directive received from His Holiness in my very first official meeting with him in April this year. 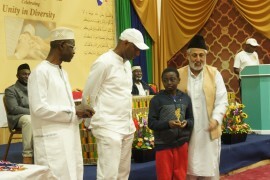 I believe, and believe on reasonable grounds, that an understanding of this unique positioning of PAAMA within the overall structure of our Community is pertinent to appreciating the special role that PAAMA can play as a conduit for collaboration among Ahmadi Muslims of African origin the world over – be it in relation to sharing news of various activities around the world with our membership here through our website and newsletter; in joint fundraising enterprises for charitable endeavours or capital projects; or in providing an outlet for matrimonial matches by creating a network of members of the same faith and ethnicity across various continents. We welcome your ideas and invite you to visit our marquee to share your thoughts on more ways to collaborate. I realise that some of our non-Ahmadi guests are joining us here for the first time. Let me therefore take a moment to say a few words by way of introduction to the Ahmadiyya Muslim Community. The Ahmadiyya Muslim Community represents a renaissance of the true Islam that was beautifully practised by the Holy Prophet (saw) and his illustrious companions. It is a renaissance that was initiated 125 years ago by its Holy Founder, Hadhrat Mirza Ghulam Ahmad of Qadian (as). He was a man of tremendous humility who came to greatness submissively under a grand prophecy pledging that his message, the message of true Islam, would spread to the corners of the earth. Under the guidance of his elected Successors or Khalifas, the fulfilment of that glorious prophecy has seen the Ahmadiyya Muslim Community spread to over 200 countries of the world with its membership in tens of millions. Our motto, ‘Love for All, Hatred for None’, is a simplistic yet highly effective modus vivendi. For the Pan-African Ahmadiyya Muslim Association, this motto is no credo of convenience. We seek to propound this beautiful tenet not merely in words but as part of the genetic constitution that permeates our every action. It is a guiding principle which inspires a social, moral and spiritual edification, induces a measure of character in our membership and instils in us, as enjoined by our faith, love for and loyalty to our country where we reside and, by default, the continent of Africa. To achieve this PAAMA provides a platform like this event where its members can meet, engage and exchange ideas with the intellectual elite of Africans in the diaspora with a view to promoting mutual respect and finding common grounds to enlighten the people of Africa about religious affairs and secular matters. Over the past few years, as many countries across Africa celebrated the 50th anniversaries of their independence, PAAMA held a series of “Africa at 50” events to commemorate, in its own distinctive way, the milestone reached by African states. 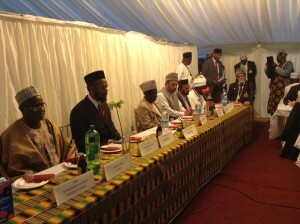 The distinction of these events was that they were graced by the august presence of the Head of the Worldwide Ahmadiyya Muslim Community, His Holiness, Hadhrat Mirza Masroor Ahmad, who delivered the keynote addresses, articulating the great emphasis which Islam places on the independence of each nation and each people, and on the act of freeing others from servitude and oppression. The Pan-African Ahmadiyya Muslim Association is also involved in a number of social welfare and charitable projects. Recognising the fact that water is essential for life yet 30% of the people of Africa cannot access safe drinking water and lack proper sanitation, during the month of Ramadhan, PAAMA, in partnership with Humanity First, the Ahmadiyya Muslim Community’s own international charity organisation, ran a very successful ‘Water for Life’ fundraising appeal raising thousands of pounds to install water wells and hand pumps across remote parts of Africa. The members of PAAMA, therefore, have a noble ambition of bringing hope, guidance and enlightenment to the continent of Africa to enable it to realise its true potential. 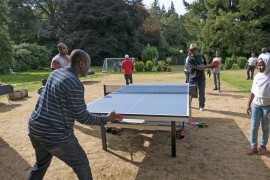 Through a mixture of religious and secular activities, PAAMA is dedicated to ensuring its membership in particular and Africans in general develop and excel in such qualities as piety, honesty, justice and fair dealing so that they can better contribute to the society in which they live and furthermore help bring about a true spiritual revolution in Africa. In short, our purpose is to return to Allah and to take with us the vast multitude of Africans caught up in the nexus of materialism and irreligion. We are duly cognisant of the magnitude of the task before us. Yet rather than deter us, it creates in us an even greater determination to rise to new heights in our endeavours that will be measured not by the depth of our pockets but by the scale of our humanity. We will combine conviction with compassion; we will combine tenacity with generosity. Our faith is resolute and our optimism infinite. 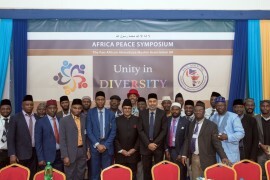 As the civil wars and internal strife in our diverse continent and complicated world seek to divide us we, the Pan-African Ahmadiyya Muslim Association, will endeavour to transcend manmade differences and bring harmony where there is discord, brotherhood where there is enmity and unity where there is division. We shall do so through our words and by our actions conveying the pristine message of Islam delivered by the Holy Prophet Muhammad (saw). We will challenge, with reason and intellectual debate, those who blame religion for the troubles of the world for it is our faith in Islam that has joined us here today and it is again our faith in Islam that inspires us to serve the cause of Africa. And that faith, when practised in its pure and true form, can transcend all barriers to create universal accord among mankind. Herein lies our hope and ambition for the continent of Africa. We stand here humble yet convinced that the One God who created goodness in every man also created a value system in the form of the religion of Islam for the manifestation of man’s innate desire to do good. And so, I close with these words for my fellow members of the Pan-African Ahmadiyya Muslim Association. Let us take every opportunity to advance the cause and welfare of Africa; let us take every opportunity to relieve poverty, sickness and suffering of those affected; let us, in the service of God and His creation, take every opportunity to sustain our determination and our courage, to renew our fervour and our dedication, to nourish our spirits and our faith so that the illusive dream of a united, prosperous, enlightened and powerful Africa can be transformed from a hollow yearning to a glowing reality. May Allah so ordain and bless you all profoundly! Respected Elders, Distinguished Guests, Ladies and Gentlemen. Thanks for having me.